Explore Bhutan's culture and heritage on this 5-day tour and experience the best of Paro and Thimpu. Visit tourist hot spots like Kuensel Phodrang, Tiger's Nest Monastery and Memorial Chorten. 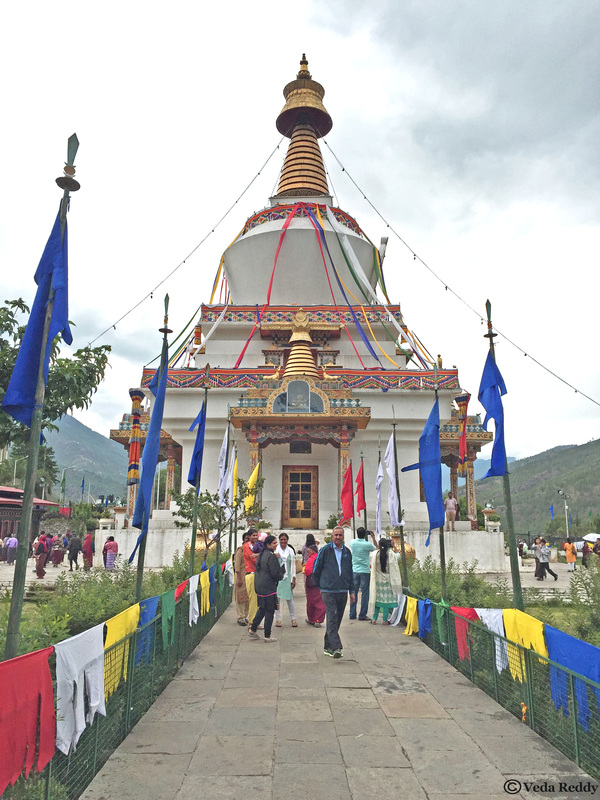 Memorial Chorten – A monument built in 1974 to honour the 3rd King of Bhutan, Jigme Dorji Wangchuck (1928–1972). Memorial Chorten is a prominent landmark in the city with its golden spires and bells. 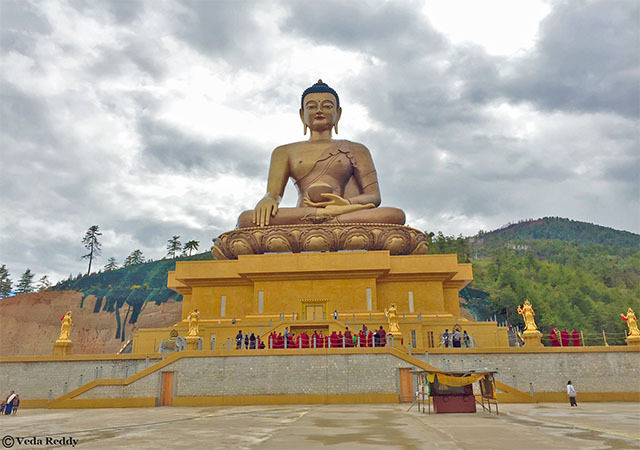 Kuensel Phodrang – World’s Largest Sitting Buddha Statue. BBS Tower – Provides a vantage point view of the Thimpu Valley. Note* Sightseeing won’t be possible if the flight arrival time is beyond 14:00 Hours. Folk Heritage Museum - Established in 2001 and provides with fascinating insights into the Bhutanese culture and way of life. The Folk Heritage Museum is set inside a three storied, 19th-century traditional house. Royal Textile Academy of Bhutan – A National Centre for professional training in weaving design and production of Bhutanese Textile. Anim Dratsang (Nunnery) - A Buddhist Monastery, built in 1976 by the 16th emanation of Thangtong Gyalpo, Drubthob Rikey Jadrel. Currently, the nunnery is home to about 60 nuns. Handicraft Emporium - An interesting market with local items and exciting souvenirs. After breakfast, check out of your hotel and proceed to Paro. The Paro valley extends from the confluence of the Paro Chhu and the Wang Chhu rivers at Chuzom up to Mt. Jomolhari at the Tibetan border to the North. This picturesque region is one of the widest valleys in the kingdom and is covered in fertile rice fields and has a beautiful, crystalline river meandering down the valley. After breakfast, continue exploring this beautiful city of Paro. Today, you can visit the Tiger Nest OR head for an excursion to the Chele La Pass. You have the liberty to choose which one among these two famous attractions you would like to visit. 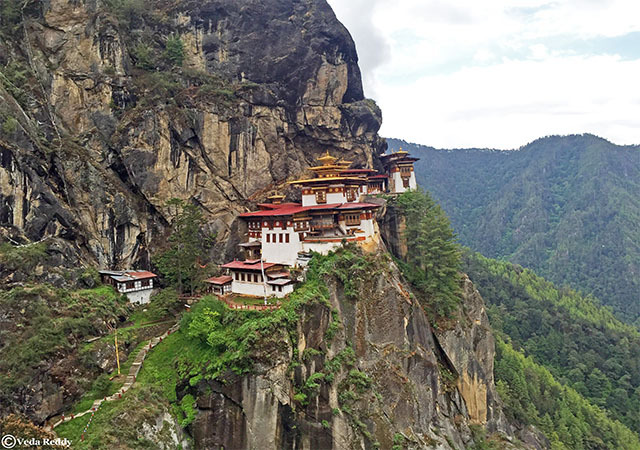 Tiger Nest - From a distance, Bhutan's most iconic monastery seems to float, weightless, halfway up a sheer cliff-face, 900 meters (3,000 feet) above the floor of the Paro Valley. As you wind your way breathlessly up the long, steep path towards Taktsang Lhakhang, the monastery periodically reveals itself, rising out of the forest, closer and more solid with each re-appearance. Chele La Pass - The highest point on Bhutan’s Dantak roads, crests at 3988 meters (roughly 13,000 feet) above sea level. The bright yellow sign marking its location stands next to a traditional stone fireplace and stove, a Buddhist prayer wheel marked with a quote advocating kindness, and a small hut and seating area. This is the last day of your Bhutan cultural tour as you travel to Paro Airport for your flight home. Note: This offer price is valid for Indian nationals only. Please contact us in case you hold a different passport. We recommend adding one additional night in the scenic region of Punakha to this itinerary.